Chanteur Country US né Robert Valentine Braddock, le 5 Août 1940 à Lakeland (Floride). 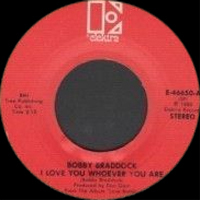 Country songwriter Bobby Braddock was one of the more prolific hitmakers of the '70s, and also made a few of his own recordings toward the end of the decade. 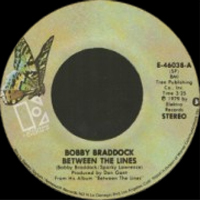 Born in Lakeland, FL, in 1940, Braddock first entered the music industry as a keyboard player for Marty Robbins, whose backing band he joined in 1964. 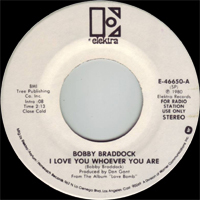 Two years later, Robbins recorded the Braddock-penned "While You're Dancing," and had a chart hit with it. 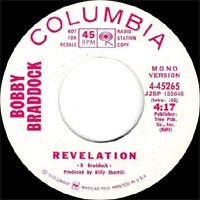 Building on that foundation, Braddock joined the songwriting staff at Tree International Publishing, where he replaced Roger Miller. 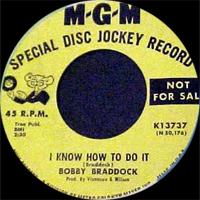 He also found work as a session musician, and began making his own recordings, charting with the 1967 single "I Know How to Do It." That same year, the Oak Ridge Boys had a Top Ten hit with Braddock's "Would They Love Him Down in Shreveport," and his career was on its way. 1968 brought two Top Tens for the Statler Brothers, plus Braddock's first number one hit in Tammy Wynette's "D-I-V-O-R-C-E," which he co-wrote with Curly Putman. 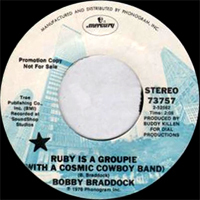 Over the next ten years, Braddock kept cranking out hits for countless artists, the biggest of which included "I Believe the South's Gonna Rise Again" (Tanya Tucker), "Come on In" (Jerry Lee Lewis), "Womanhood" (Wynette again), and the duo "Something to Brag About" (recorded by Willie Nelson with Mary Kay Place, as well as Wynette and George Jones).Braddock landed a recording deal with Elektra in his own right in 1979, and scored a chart hit that year with the title track of his first full-length album, Between the Lines. The 1980 follow-up, Love Bomb, was a semi-concept album filled with witty, southern-fried social commentary, and was followed in 1983 by the mini-album Harepore Cornography. 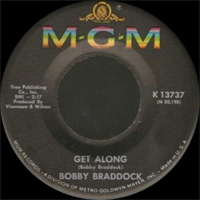 The same year, Braddock teamed with Matraca Berg to write T.G. Sheppard's number one hit "Faking Love." 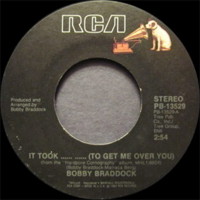 Braddock's songwriting career began to slow down a bit during the '80s, but he still came up with periodic successes, penning hits for Tracy Lawrence ("Time Marches On," "Texas Tornado") and Mark Chesnutt ("Old Flames Have New Names"), among others, during the '90s. 1983 SP RCA PB-13529 (US) It Took ..... ..... (To Get Me Over You) / ? 1984 SP RCA JK-13871 (US) Willie Where Are You? / Willie Where Are You?